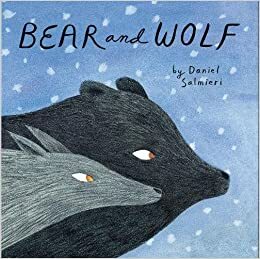 Summary: A bear and a wolf meet in the woods on a winter’s night, and go off for a walk together. They savor the sights, sounds, and smells of the quiet forest, ending up looking at fish beneath the ice of a frozen lake. They go their separate ways, Wolf to hunt caribou, and Bear to sleep the rest of the winter. In the spring, they meet again, and walk off to explore the “awakening woods”. 48 pages; ages 4-8. Pros: A quiet but beautiful read, gorgeously illustrated with soft colors that capture the winter, both close up and from a more distant perspective. Readers are led to think about slowing down and enjoying all aspects of nature the way that Bear and Wolf do. Cons: If Bear is Bear and Wolf is Wolf, shouldn’t Bird be something more specific, like Falcon? Otherwise, wouldn’t Bear and Wolf both be called Mammal? Hi, I would like to let you know that Facebook puts up a security prompt when you try to share your content. I am not sure if this is your intent or not, but as an author of a children’s book and a father, I would like to share some of the reviews and I am not allowed.